This article is the first in a projected series of four, which will discuss the theology of the Good Friday ceremony of the Missal of St Pius V, the revised version of Pope Pius XII, and the Novus Ordo. For reference, complete descriptions of the ceremony are given in part 4.1 and part 4.2 of my series on the reformed Holy Week published in 2009. The portions of this article which discuss the rite of the Presanctified properly so-called are largely taken from part 4.2 of that series, but partially re-written. A fourth article will discuss the history of the fraction rite as part of the Good Friday ceremony. The purpose of these articles is not to comprehensively discuss the origins of the traditional ceremony, or the variants thereof used in the Middle Ages. The term “Mass of the Presanctified” is not actually used anywhere in the Missal itself for the ceremony of Good Friday, but is commonly found in Holy Week books printed for the convenience of the clergy during the busiest week of the year. Although it is in that sense perhaps purely informal, it nevertheless gives an accurate sense of what the rite actually does and means. To the largest degree possible, this rite imitates the rite of the Mass, to signify that what it commemorates, the Sacrifice of Christ on the Cross, was anticipated at the Last Supper, and is intimately and essentially connected with it. The celebrant wears black vestments as for a Requiem. The deacon and subdeacon, however, wear black folded chasubles, the traditional vestments of penitential seasons, which are not used at a Requiem; indeed, black folded chasubles are only used at this service. (Where they are not available, the deacon and subdeacon serve in albs and maniples, the deacon with a stole.) On these days, the Church wishes us to experience the Paschal mystery, not as a mere commemoration, but as something through which we ourselves live, accompanying the Savior. Good Friday is a day of deepest mourning, one that excludes the use of the vestments of joy, the dalmatic and tunicle, which at a Requiem speak of the hope of the Resurrection. On Good Friday, this hope is not in any way anticipated; we ourselves feel the desolation which Christ’s disciples experienced, the better to come to the joy of the Resurrection on Easter. The Mass of the Catechumens has an extra reading, sung by a reader in surplice. It is followed by a tract, and then a prayer, which is introduced by “Oremus” sung by the priest, “Flectamus genua” by the deacon, and “Levate” by the subdeacon. These are done as they normally would be at a solemn Ember-day Mass. The subdeacon sings the second reading with the same ceremonies as at a solemn Mass, followed by a second tract. The Passion of St John is sung with the same ceremonies as those of Matthew, Mark and Luke on the previous days of Holy Week. The last part is sung like the Gospel at a Requiem, by the deacon of the Mass, without candles or incense; as at solemn Mass in penitential seasons, he replaces his folded chasuble with the broad stole. The solemn prayers are said at the Missal on the Epistle side. After each invocation, “Oremus. Flectamus genua. Levate” are said as above by the major ministers, followed by the collects. The adoration of the Cross has no analog in the Mass, and was originally a separate ceremony; at this point, the priest and subdeacon remove their chasubles, putting them on again once they have kissed the Cross. For the final part of the ceremony, the Blessed Sacrament is brought back from the Altar of Repose to the church’s principal altar, with a solemn procession done in reverse order from the procession of the day before. This ritual of the double procession emphasizes in the clearest way possible the connection between the Lord’s Supper and His Sacrifice upon the Cross. At the Mass of the Lord’s Supper, the celebrant consecrates two large Hosts, one for the Mass itself, the other for the rite of the following day. One of the most beautiful aspects of the Holy Thursday ritual is the special way in which this second Host is prepared, before the celebrant’s communion. It is placed in a chalice, not in a pyx or ciborium, and then covered with a soft pall, a paten turned upside down, and a thin white chalice veil, which is then tied with a ribbon around the node of the chalice. The Host thus enclosed in the chalice is left on the corporal, until the end of the Mass, when it is brought to the Altar of Repose. This custom of enclosing the Body of the Lord in a chalice is a sign of His Passion, which He Himself describes as a “chalice” when He goes to pray in the garden. (Matthew 26, 39-42 and Luke 22, 42.) It also serves to indicate the link between the first Mass, the Lord’s Supper, and the Sacrifice of the Cross, which takes place on the following day; the instruments of the Sacrifice of the Mass, the chalice, pall, paten and veil, are used on both days. The Sacrament altar at the church of San Marello al Corso in Rome, Holy Thursday, 2015. On Good Friday, therefore, after the adoration of the Cross, the priest, with all of the major and minor ministers and attending clergy, goes by the shortest way to the Altar of Repose, where he kneels down along with the deacon and subdeacon. The deacon then rises, opens the tabernacle, genuflects, and brings the chalice with the Host inside forward so that it can be clearly seen, without removing it from the tabernacle, and returns to the side of the priest. The three major ministers rise, and the priest imposes incense in two thuribles; with one of these, he incenses the Blessed Sacrament as at Benediction. He then dons the humeral veil, while the deacon goes up to the altar, and brings him the chalice with the Host inside. All of the acolytes and attending clergy form a procession, and return to the main sanctuary of the church, while the choir sings the hymn Vexilla Regis. Immediately before the priest, who holds the chalice under the humeral veil, two acolytes take turns incensing the Blessed Sacrament. When they arrive before the main altar, the deacon receives the Sacrament from the priest, takes It up to the altar, and unties the ribbon which holds the veil on the chalice. He then arranges the veil, without removing it from the chalice, in the same way that a chalice is set upon the altar for the celebration of Mass: another clear sign of the connection between the Mass and the death of Christ upon the Cross. The priest incenses the Sacrament once again, and the “Rite of the Presanctified” properly so-called begins. The major ministers go up to the altar and genuflect. The deacon removes the chalice veil, paten and soft pall, then holds the paten with two hands over the corporal. The priest takes the chalice, and allows the Host to slide from it onto the paten, then puts it down. He receives the paten from the deacon and places the Host upon the corporal. The deacon puts wine in the chalice, and the subdeacon a drop of water, as at Mass. The deacon gives the chalice to the priest, who places it in the middle of the corporal, and covers it with the pall. All of the Offertory prayers and gestures are omitted. As at the Offertory of Mass, the thurifer comes to the priest, who imposes incense without blessing it, and, accompanied in the usual way by the deacon and subdeacon, incenses the Host and chalice, Cross and altar as at a Solemn Mass, genuflecting whenever he passes before the Sacrament. (Neither he nor anyone else is incensed.) Then he washes his hands, as at a normal Mass, but saying nothing. Returning to the middle of the altar, with the deacon and subdeacon in line behind him, the priest says the Offertory prayer “In spiritu humilitatis”; he then kisses the altar, turns to the people and says “Orate fratres”. The response “Suscipiat” is not said, and the priest does not complete the usual turn in a circle. As the rubrics of the Missal say, he “omits the rest”, (Secret, Preface, Sanctus and Canon), and passes directly to “Oremus. Praeceptis salutaribus.” and the Lord’s Prayer, sung in the ferial tone. He then sings the embolism “Libera nos” out loud, also in the ferial tone, omitting all of the gestures which normally accompany it. The deacon and subdeacon kneel on either side of the priest, slightly back from where he stands; as the priest solemnly elevates the Host, they lift his chasuble, and in place of the bell, the “crepitaculum” or noisemaker is sounded. The deacon and subdeacon rise, and the deacon uncovers the chalice. The priest performs the Fraction of the Host, saying nothing and omitting the signs of the Cross. Bowing over the altar, he says the prayer “Perceptio corporis tui”; following the usual rite of Mass, he communicates with the Sacred Host. He then consumes the chalice with the wine and the Particle in it, omitting the usual rites. All of this follows, step by step, the rite of the Offertory of the Mass, and the prayers of the celebrant’s communion after the Canon. Obviously, all of those elements which refer specifically to the celebration of the Eucharistic sacrifice are omitted, along with the Canon itself. (The fraction, however, is done after the Embolism, not during, since the latter is sung aloud.) Here we have another clear sign of the sacrificial nature of the death of Christ. The rubrics of the Missal underline this principal that the rite is modeled on the rite of Mass; everything in them is described in reference to the practice of the normal celebration of Mass. The priest purifies the chalice and his fingers; the subdeacon then restacks the chalice, and the deacon removes the broad stole and vests again in the folded chasuble, again, all as at a solemn Mass. 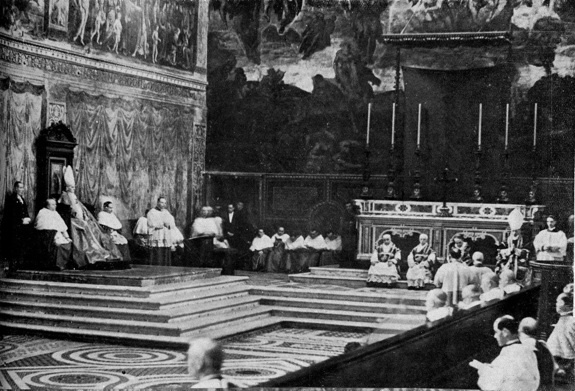 Since it is a longstanding custom of the Church that only the celebrant receives communion on this day, at this point the liturgy is effectively completed and the priest, the major and minor ministers, and the attending clergy return to the sacristy in silence. This brings us to the second major point of the ceremony, the silence of the congregation, and the relative silence of the ceremony as a whole. The parts that are said aloud consist almost entirely of the words of Scripture and the prayers, sung by the clergy, and the choir’s parts. The presentation and adoration of the Cross celebrated by His Holiness Pope Benedict XVI at St Peter’s Basilica in 2011. The first tract of the ceremony is taken from the song of the Prophet Habakkuk (the whole of his third chapter), according to the Old Latin translation of the Septuagint: “O Lord, I heard Thy report, and was afraid: I considered thy works, and was amazed.” These echo the famous prophecy of Isaiah known as that of the Suffering Servant (chapter 53), “Who hath believed our report? and to whom is the arm of the Lord revealed?” The tract continues with the words, “thou shalt be known between two living creatures”; the “two living creatures” were first understood by St Augustine as the two thieves crucified alongside the Lord. The final point to note is the fact that Communion is not distributed to the faithful at this ceremony. The “communion” which is received that day is the kissing of the Cross, for which the faithful come forth to the area of the sanctuary as they did the previous day at the Mass of the Lord’s Supper. Their participation in the Paschal mystery is vividly represented by following as closely as possible those members of the Church who lived it first, the disciples of Christ, who also received Communion on Holy Thursday. Good Friday is likewise lived as the disciples lived it, as a day of lamentation, without the grace of Communion, but with the grace of staying close by the Cross, like the Virgin and St John. This relatively late practice of the Roman Rite is in harmony with the broader tradition of the historical Christian rites. 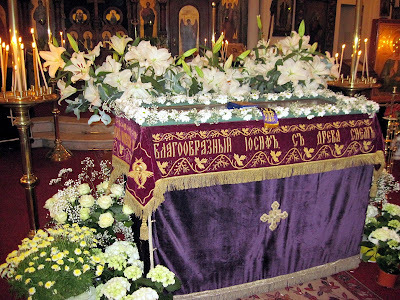 To this day, the Ambrosian rite maintains the custom of having no ritual involving the Eucharist on Good Friday at all; likewise, the Byzantine Rite has the kissing of the shroud of Christ, but no sort of Eucharistic ritual. It is of signal importance to note here that the ritual of the Presanctified also represents this by having a fraction rite which is, so to speak, incomplete, because the particle is dropped into unconsecrated wine. (This is a rite with a very complex history, which will be addressed in a future article.) At a normal Mass, the Fraction rite, the reunion of Christ’s Body with the Blood shed for our redemption, represents the Resurrection; on Good Friday, the Resurrection is not made manifest, because the Body is broken, but not reunited with the Blood. It is also worth noting in this regard that the rubrics of the Missal of St Pius V, and subsequent decrees of the S.R.C. in regard to the ceremony, assume that the same Cross, which comes from the main altar, is kissed by the clergy and all of the faithful. Likewise, the S.R.C. strongly prohibited all attempts at having any kind of Eucharistic adoration or procession on Good Friday, where such customs had arisen as a matter of popular piety.